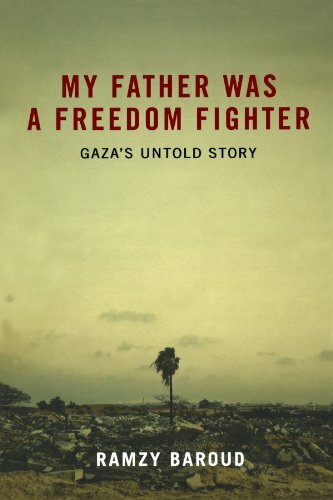 Tell me about your first choice, My Father Was a Freedom Fighter. This is a wonderful book – it’s a history book, it’s a work of literature, it’s a memoir . . . Ramzy Baroud is a political commentator and historian, editor of the Palestine Chronicle and editor of a book called Searching Jenin: Eyewitness Accounts of the Israeli Invasion about the events of 2002. He grew up in the Gaza refugee camp and is very familiar with the psychology of the people in the camps – to this day they’re holding out hope and still dreaming of going home. He captures this delightfully and his descriptions of place and people are just magnificent. These sorts of works are so important because, you know, when people write about Palestine it tends to be in dry, sterile prose. There is nothing dry about this book – even though it’s non-fiction it is full of emotion and wonderful characters. 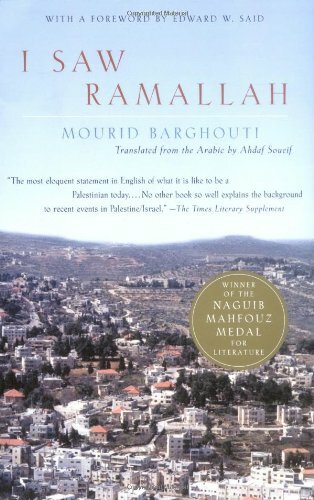 Let’s move on to I Saw Ramallah by Mourid Barghouti. This seems like an extended poem as well as the story of a journey. Yes. The language for me is almost more important than the story which is a moving account of his homecoming. Mourid writes very much in the Arab tradition of poetry. And he depicts a situation that so many of us in exile or living under occupation feel. Occupation interferes in every aspect of life and death, he says; ‘it interferes with longing and anger and desire and walking in the street’. But life goes on. I am in Palestine at the moment for the literature festival and what I see among the young people is so humbling. Students from Gaza University are telling us about how they’re missing basic necessities but mostly they’re starving intellectually – desperate for books and knowledge. What they’re living under is so inhuman but they have such remarkable spirit. This is the untold story – for all these years Palestinians have been going on with their lives, getting an education, getting jobs, getting married, and dealing with this occupation as best they can, going through checkpoint after checkpoint, roadblock after roadblock, one procedure after another, and yet they still live. That’s what is so often missing in the dominant mainstream narrative about Palestine and how Palestinians have been resisting passively for 62 years simply by going on, refusing to break or hate . 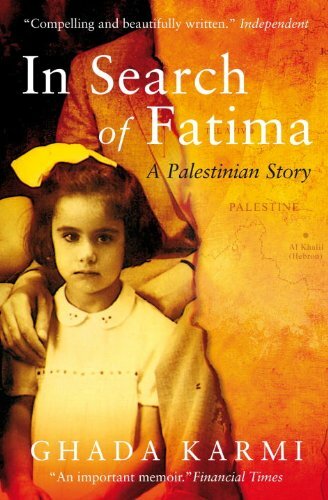 . .
What about In Search of Fatima by Ghada Karmi? Who is Fatima? Fatima was the Karmi family’s much-loved governess or nanny. 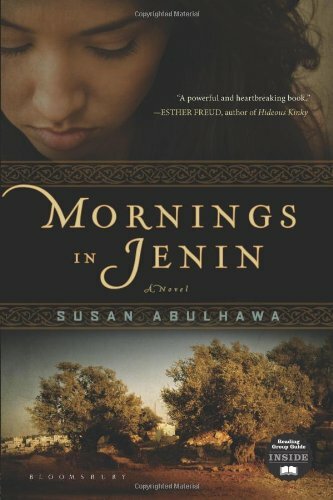 This is another memoir, a memoir of violent uprooting and dislocation, presented in an intimate and very personal way.The Karmis were one of the wealthy Palestinian families of Jerusalem who overnight became penniless [in 1948 during the creation of the State of Israel] and left their home complete with furniture, pictures, food, everything – at that time Jewish families literally walked down the street and picked out the homes that they wanted. The family ended up in the UK and Fatima was left behind with her family. They never saw her again. Didn’t they go to live in a Jewish area of London – Golders Green? Yes. 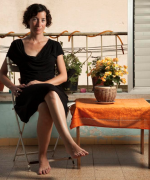 Ghada became fully assimilated and her schoolfriends were Jewish. She gives an account in the book of going to a Jewish friend’s house for a bar-mitzvah or wedding or something and the family raises the Israeli flag and sings Zionist songs. She tells how strange and shocking it was to see these people she loved raising the flag that flew over the demise of her family and country. You can imagine the emotional conflict. Yet it’s a very tender book. Now Palestinian Walks. This is not a guidebook, is it? No, no, no. Actually, Raja Shehadeh is a walker – he’s also an attorney living in the West Bank, and a very unassuming, soft-spoken man. 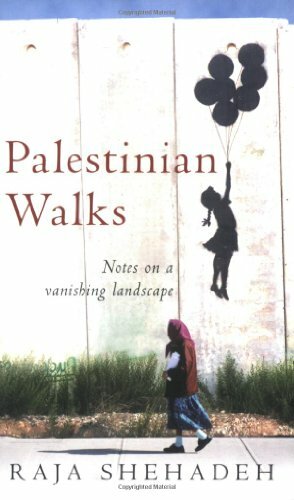 In this book he describes the walks he took in Palestine over decades, detailing the changing landscape. This is just one man who took all these walks and the outward walks are symbolic of inner journeys. When there are places he can’t walk because of Israel having drawn different borders he goes into himself and explores his own personal borders. His reflections on what he sees are gentle in their approach to describing an awful and harsh illegal military occupation. Raja is a beautiful soul who has a way of talking about the politics without talking about the politics. 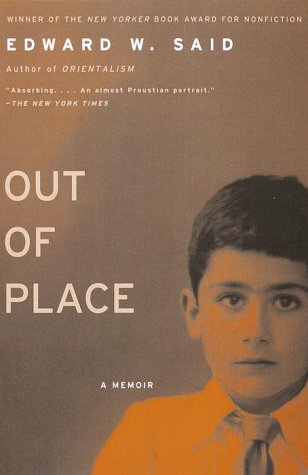 And your final book, Edward Said’s Out of Place. Edward Said has a very special place in my heart, as he does, I think, in every Palestinian heart. He was a giant of a man and I was gutted when he died. In some ways I thought he was bigger than life – bigger than death. But of course he wasn’t. This is a very intimate book about his young life. His parents were domineering or distant and he talks about always feeling stranded, left behind, out of place. This book resonates with me, not just because I absolutely love the man but because it mirrors a lot of my own feelings about being a diaspora Palestinian – you perpetually feel out of place, you never really have a sense of belonging, just existing in the winds wherever you are. 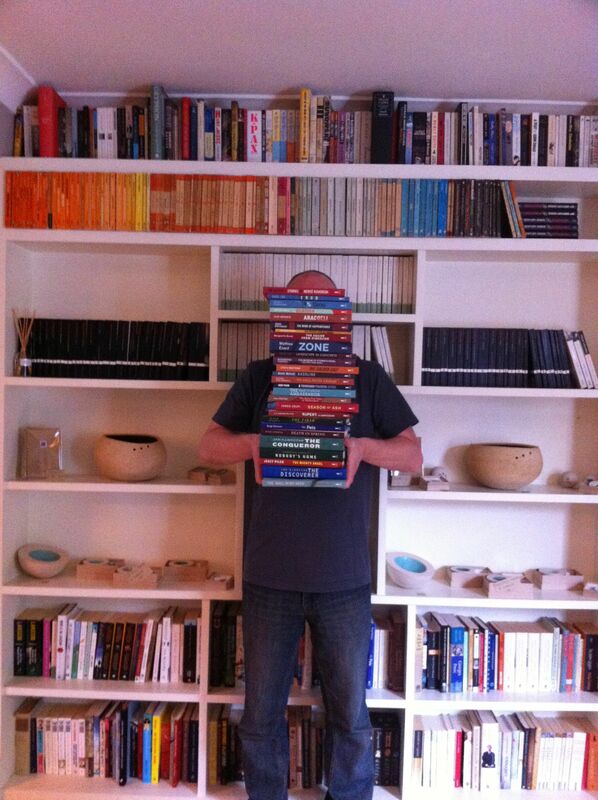 Your book choices are all quite similar, aren’t they? Yes, well these are my favourite Palestinian books and I love all of them. But my favourite book of all time is One Hundred Years of Solitude by Gabriel García Márquez!